Standard - $99.99 Only 1 left! You’ve waited for this moment. Deep down, you always knew that it was your destiny… to wield the Dragon Dagger! You know, the legendary weapon from the Mighty Morphin Power Rangers? Ever since you first saw Tommy Oliver play it to summon his mighty Dragonzord, you knew. You just knew that you’d someday wield it as well. And now, it’s finally the time. 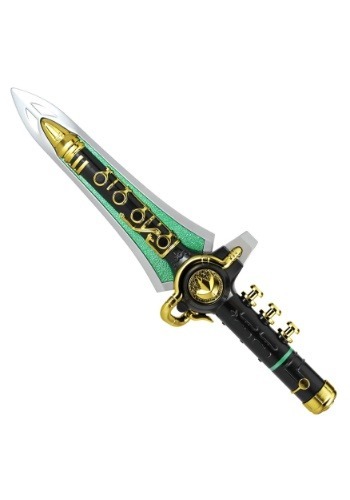 This Mighty Morphin Power Rangers Dragon Dagger helps you achieve your destiny of becoming the Green Ranger. This replica weapon spares no detail in recreating the prop from the original Mighty Morphin Power Rangers series. It’s made out of die-cast metal and molded plastic. It features the brilliant silver, black, green, and gold colors from the original dagger and comes with 3 buttons on the grip. Each button plays a different sound from the show, including the Dragonzord summoning tune, the Power Rangers theme song, and more. If you plan on cosplaying as the Green Ranger, this dagger will add that extra touch of authenticity to put your look over the top. When you’re all done being the Green Power Ranger, then you can place this dagger on your bookshelf as a high-quality addition to your Power Rangers collectibles.